Fifty protesting workers of Ahwaz Steel National Industrial Group participating in protests on Monday June 11 were arrested by the authorities. Reportedly another group of workers who had gathered on Tuesday to protest the arrest of their colleagues were also arrested. According to Human Rights Activists News Agency (HRANA) their reporters were at the protest location on Monday but protesters were immediately attacked by security and riot police and of the fifty who were detained on the spot, so far only fifty have been released. Reports add that following Monday’s events, the workers gathered in front of the governor’s office on Tuesday to decry the arrest of their peers. Ten other workers were reportedly arrested on Tuesday. 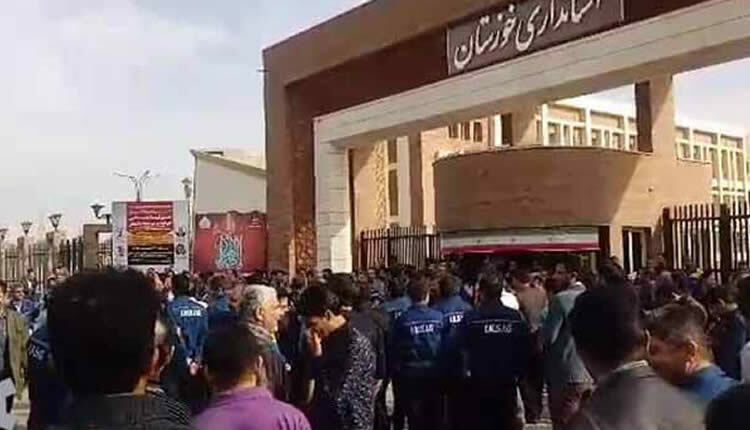 Gholamreza Shariati, Governor of Khuzestan confirmed the arrest of the workers in an interview with ILNA and reported that his office is following up on the detentions. The detainees have been taken to Ahwaz Drug Crime Centre and their families have gathered at that location since Tuesday morning to ascertain their situation. Monday’s protest was the thirteenth day of the protests. The workers had started their protests in front of the Governor’s office and after getting no results, had moved on to block the Ahwaz-Tehran train route for one and a half hours to make their voices heard. They then returned to the premises of the Governor’s office chanting slogans urging the authorities to heed their demands. The workers have not been paid for over three months and their benefit premiums also remain unpaid for longer than that. The workers are concerned that the recent changes in management could lead to complete shutdown of the plant. Ahwaz Steel National Industrial Group was among the confiscated assets of Amir Mansour Investment Group that was handed over to the judiciary after its director was convicted of financial fraud amounting to 3 billion toumans (71 million USD). Currently, the only functioning section of the plant is pipe production and the other sections are closed due to a shortage of raw materials. The workers maintain that the government is in a position to assist with the provision of raw materials in order to re-open the other sections of the plant. Khuzestan Governor has announced that it is trying to come to terms with the banks and the Privatization Organization over the assignment of 50 billion toumans for the revitalization of the plant. In recent years many of Iran’s factories and manufacturing units have shut down due to an ailing economy leading to widespread unemployment and labour protests.